In this space wallpaper, NASA's Kepler mission has discovered the first Earth-size planets orbiting a sun-like star outside our solar system.The planets, called Kepler-20e and Kepler-20f, are too close to their star to be in the so-called habitable zone where liquid water could exist on a planet's surface, but they are the smallest exoplanets ever confirmed around a star like our sun. Kepler-20e is the first planet smaller than the Earth discovered to orbit a star other than the sun. A year on Kepler-20e only lasts 6 days, as it is much closer to its host star than the Earth is to the sun. The temperature at the surface of the planet, around 1400 degrees Fahrenheit, is much to hot to support life, as we know it. Kepler-20e is likely to be entirely rocky and without an atmosphere. The planet is tidally locked, always showing the same side to its host star, as the moon to the Earth, and could have large temperature differences between its permanent night and day sides. 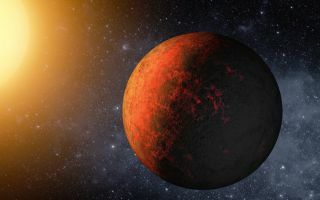 Astronomers think that the planet is likely to be geologically active, due to its own formation process and the strong gravitational interactions with its host star. In this artistic depiction, the planet is represented with active volcanoes on both the night and day sides.